I just saw an ad for it on YouTube. I don’t know when it is or was. First I want to say...if I every said anything bad about Bushka videos, I take it all back. Not everyone is perfect and I shouldn't dismiss his whole body of work when he may say one thing or other that I don't necessarily agree with. So after running terrible battles, it was time to reflect and watch some of Bushka's videos on T110E5. (I think I've watched his most current T110E5 video about 3 times so far and I'll probably watch it some more). I realized when I thought I was hulling down, I was yoloing down. It was a matter of millimeters, but I was just exposing too much when I thought I was hulling down. So after watching Bushka for the third time I had the gem below against some stiff competition. In this game, I felt very much in control. It felt really good, but at the same time it did feel like work to get those results. I'm at the point I want the results and am willing to do the work for the results. I fully controlled the position and turned away T-62, Leopard 1, WT auf Pz. IV, and fought the Grille. I goofed at the end when I got excited to kill the Grille. lol. I have never been shot at so much from a Grille and survived. That's definitely the most shots I've ever bounce from Grille. I have found a few places on a few maps that work great for T110E5. I will continue to work on hull down, finding and learning spots. Take a look and feel free to critique. Hopefully I can continue to build from this. Again, A huge thank you to Bushka. Without his videos I would be real doo doo. I am convinced that my daily stats for Aug 4 will have a significant shift upwards. Edited by ___ez_e___, 03 August 2018 - 11:17 AM. 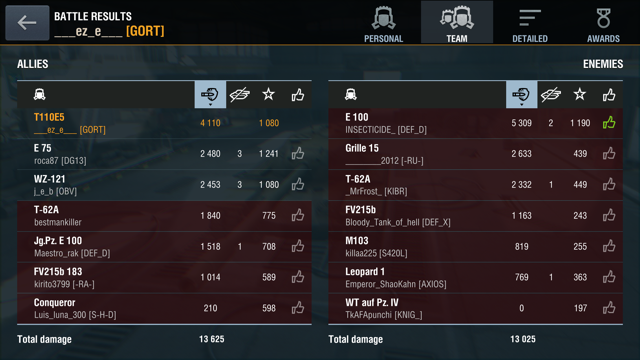 So I think I am finally getting tier X.
I figured out how to deal with E100, T110E4, 183, grille. I can now effectively brawl and bounce shots or hull down and bounce shots. I averaged 2428 dmg with 60% wr and I'm comfortable now. Before I wasn’t comfortable when I hit the battle button. Now it’s just like any tier, I review the matchups on load up and act according. I actually believe I can improve upon the results. I actually made some mistakes in 2 battles. Grille was last to live and I had him beat to reload, but he fired faster then me. I couldn't figure out why. So I asked the KRONO's driver of the Grille, He reminded me that when he has less then 10% health, the adrenaline kicks in which allowed him to beat me to fire by a millisecond. My mistake. We were both one shots and I thought I could out reload him, but not in this situation. In another battle I made the cardinal sin of exposing myself, because enemy was one shot kill. So bounce, bounce, bounce, and die and lose. My bad. What do you think of Supremacy? 75% of my losses where due to Supremacy and you can see by my low damage we lost by cap timers. I’m going to keep an eye one this. Do most super unicums play Supremacy? Do you think it has a significant impact to stats? I do think I'm on the road to unicum and then hopefully super unicum. I'm confident I will be successful in meeting this challenge, but I might need more then the original 30 days. I'm having a blast now.in tier X. It's the most fun I'm having since I started. Folks in game have been supportive. Edited by ___ez_e___, 02 August 2018 - 09:00 PM. My stats fell down since I played a huge volume, but I need to learn how to role with a team when there isn’t much places to hull down in the T110E5. My issue is still getting pennable dmp. Since I’m trying to find hull down spots I was ending up to isolated from the battle. Then I couldn’t move fast enough to be useful to the team. I realized in order to get the avg dmg up I have to be on on near the front line. So I’m learning how to be frontline without much traditional hull down. I’m slowly learning how to maximize the gun depression. I’m definitely efficient on some maps and not others. I can create and hold choke points in some maps and other I’m still figuring out. I’m going to reduce volume and work on getting stats back up. Played some good game and some bad games, but I haven’t had great games like I do in lower tiers. Edited by ___ez_e___, 06 August 2018 - 11:15 PM. Dude, stop and look at your 30 day stats. You have a 1.06 DR and 1707 Avg Dmg. You are pushing way to much. Watch all your replays- load them into map Inspector too. I'd also recommend getting comfortable using HE against these paper TD's. I am definitely a much better player in the T110E5, but currently my stats do not show it. I had to take a step back and get more experience in different situations, because I was and am still learning where to put the T110E5 on battles fields. I played a huge volume of games way above my norm, because I had to get out there and see what works on certain maps. Lucky for me, most of the games I've seen forumers...weren't not my worst games so I hopefully didn't embarrass myself. I know for may of you....I'm talking nonsense because my stats are down. Hopefully I'm starting my upward climb now (but I still don't feel comfortable on every map and situation). I will give a solid update at the 30 day mark. Edited by ___ez_e___, 16 August 2018 - 02:45 PM. If you are interested in my progress...now is the time to watch me and to click on "Latest". Then click on the actual T110E5 tank to see my daily stats. You will see that in the past few days I've made a significant turn around. 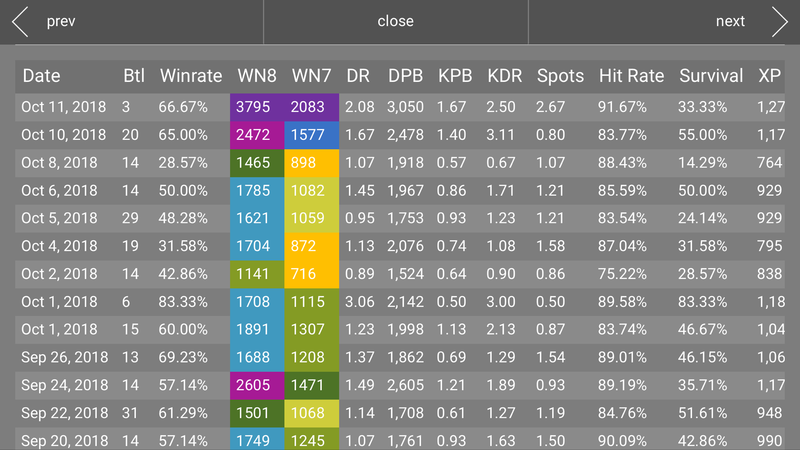 I'm not perfect and I don't claim to comfortable on every map, but you can definitely improve your stats if you really make the effort. I think it will take me close to 60 - 90 days to get my stats close to my target. I'm finally playing at a more consistent higher level. From August 14, 2018 my stats have improved. I will see how far I can bring up my 30 day stats. I'm still improving. learning maps, and spots. Below is an example where I lead the charge and had 0 hp damage. I turned turret towards 140 and 62 to bounce shots. I also juked the E100. Below is one of my better outing. Also notice that I didn't take damage until the battle was well in hand. Edited by ___ez_e___, 21 August 2018 - 02:55 PM. 1 of 5 battles I had today had bad lag. I could only do 1000 dmg. It crashed my daily stats. It should go up some more once I pass August 13. I found that once I played over 10-15 games my avg dmg would drop. I’m now trying to keep it to 10 battle max. Yesterday’s stats got messed up because I played poorly then forgot about update and didn’t get to play a more to recover. Otherwise my stats are trending upwards in September. I picked the T110E5 for this challenge for several reasons. 2. It’s still my most difficult tier X tank. I figured learning to play the difficult tank in different situations would help me with other tanks to a degree. 3. It continues to be my only non-grinding tank that is below 50 wr. I’m still learning maps and spots for the T110E5. I will update when I hit another milestone. Edited by ___ez_e___, 12 September 2018 - 12:18 PM. I started the challenge on July 21 with the goal of turning around my stats in 30 days. I'm now 82 days into my challenge and I feel as though I'm super close to the playing level of my goal. I was stuck at about 2000 dmg per battle and decided to watch some videos by Sk8xtrm. From reviewing his videos, I found a few tactics I was missing. I was over angling for sidescraping, I have now adjusted my angle to either straight on or slight angle. The big tactic I was missing was moving my tank back and forward when taking incoming fire. I think it has made a huge difference in my ability to bounce shots. I believe it's making it that much harder to pen the lower plate (I'm assuming that is where most folks are aiming). My decision making is definitely different. i can tell with reasonable accuracy the probability of a win and difficulty of battle based on match up of load up screens. I now think I'm on the cusp of achieving my goal and hopefully I can keep my streak going. Also, I have noticed I am playing my obj 140 much better and just about every other tank due to this challenge. No it's not the mm. You can get better, even playing completely solo. Edited by ___ez_e___, 11 October 2018 - 04:37 PM. Edited by Jaq___, 11 October 2018 - 04:43 PM. Definitely the best I’ve ever done and I know I still have room to improve. Edited by ___ez_e___, 12 October 2018 - 02:51 AM.